This Leslie Thrasher oil painting was created for the cover of the August 20, 1927 issue of Liberty magazine. This painting was used as part of the "For the Love O' Lil" series created weekly for 6 years by Thrasher from 1925 thru 1931. 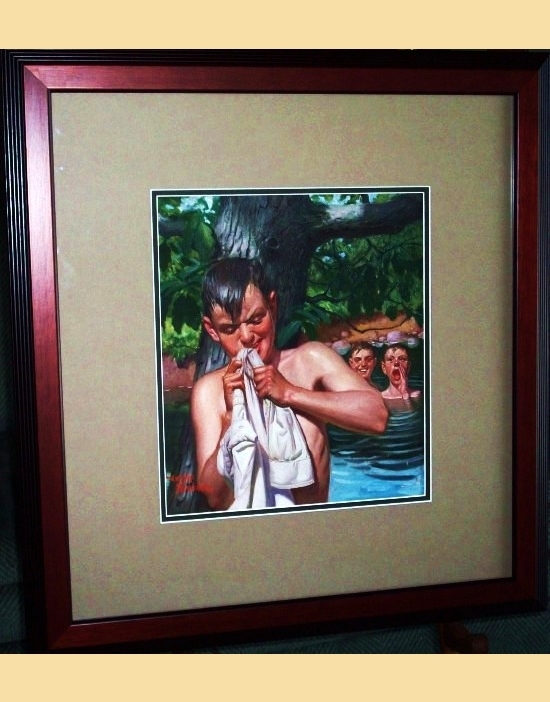 This is a wonderful image depicting three boys swimming in the water at their favorite swimming hole, while one tries to remove a knot from his shirt. This painting has a great Norman Rockwell type of "americana" appeal, taking the viewer back to the long, lazy days of summer, from which childhood memories are made. As you move the cursor over this image, you will also see the 1927 Liberty magazine for which this painting was used. Leslie Thrasher was born in Piedmont, West Virginia on September 15, 1889. His mother encouraged his artistic talents at an early age, and he was sent to the Pennsylvania Academy of Fine Arts in 1906. In 1909, he was awarded a traveling scholarship, and was able to study in Paris for a year. Upon his return to the US in 1910, Thrasher came to Wilmington, Delaware to study with Howard Pyle. In 1920, Thrasher married Janet Jackson in Wilmington and moved with her to New York City and Setauket, Long Island. They had one daughter, Audrey. Thrasher was best known for his humorous images which graced the covers of Saturday Evening Post and Liberty magazines. In 1912, Thrasher had his first painting sold to Saturday Evening Post for $50.00. By 1925, he had contracted with Liberty magazine to do a cover a week at the rate of $1000 per cover. The magazine called this idea the "continuity cover", and was a weekly series telling the story of the typical middle class American family, with the likeness of the father being portrayed by none other than Leslie Thrasher himself. The story depicted this couple from their high school romance, adding family and extended family, through their middle age. This weekly story on the covers of Liberty magazine was made into a full length movie, "For the Love O' Lil". Thrasher created this series for Liberty for 6 years. Leslie Thrasher also did other story illustrations in addition to ads for Fisk Tire Co., Chesterfield cigarettes, DuPont, and Cream of Wheat, for which he is well known. These appeared in magazines such as Everybody's, Colliers, Redbook, The Popular Magazine, and others. On December 2,1936, several days after being rescued from his burning home, Leslie Thrasher died of pneumonia induced by smoke inhalation. Several of his paintings were also lost in the fire. Leslie Thrasher had achieved such respect and popularity in the illustration world, that one can only wonder if his life had not been so tragically cut short at age 47, that he may have achieved the reputation of Norman Rockwell. Both artist's work had the same "americana" appeal. By the time he left Liberty magazine, Leslie Thrasher had produced more cover paintings than Norman Rockwell did in his whole career at the Saturday Evening Post. Leslie Thrasher had become one of Howard Pyle's most commercially successful students.